Double Layered Hair bow has cute yellow birds sitting in a row. The bottom layer is a lime green grosgrain ribbon with pink moon stitch on the side. Then a pink 7/8" grosgrain ribbon with yellow birds is the top layer. 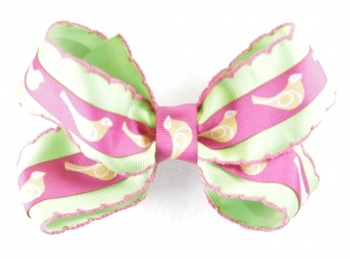 The center has the same yellow bird that wraps this bow and attaches to a French clip.